These are my BEST SELLERS. I make a guest book from the engagement photos. They sell themselves. Here's examples of a book that I had at a Bridal Show, and I had potential brides sign the book for a chance to win a free one. Thanks so much for sharing. How are your pages finished? and WHAT type of pen do you recommend to your brides to provide the guests to sign the book? 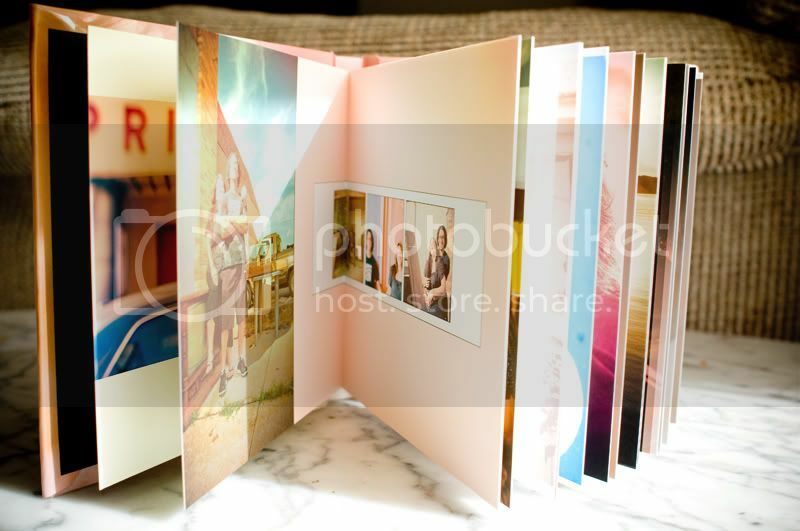 The pages are NOT laminated, just the regular matte finish. I have found that regular ball point pens work the best. 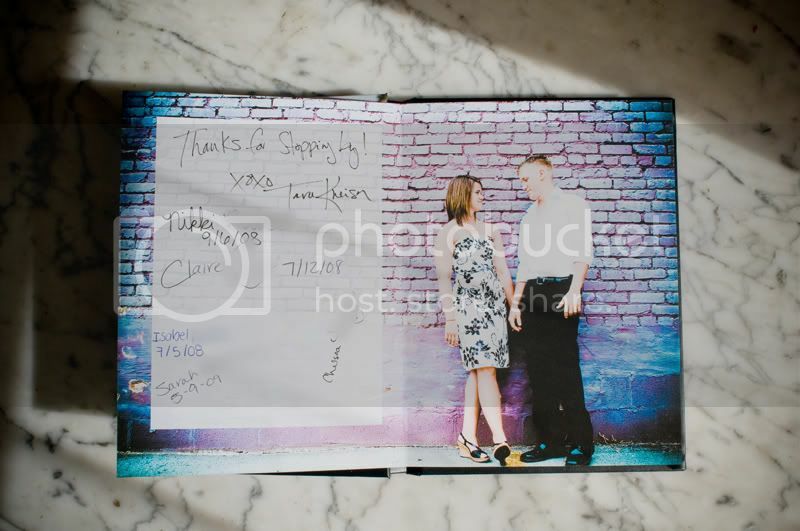 Last weekend, the bride and groom bought fine point sharpies, and one broke, nearly ruining the book. I overheard a guest say that the ball point pen worked better than the "fancy" sharpies. Avoid gel inks, they don't dry as fast, and could transfer to the opposite page when closed. I only offer 6x8, 8x6 and 6x6 as guest books, and I just do 15 spreads. I have a flat rate for all 3 sizes, and let the clients choose, according to taste. I tell my clients to pick 25-30 images from their engagement session, and then design in about an hour! I did one book that was 9x12 at a 300+ guest wedding, and it was too much space. If it helps, I've raised the price on these books 3 times this year, and they're still selling to about 90% of my wedding clients. I hope that helps you with your pricing. I love the VA book as a guestbook. I only use the 6x8 horizontal (or is it 8x6... I never can remember which way the measurements go). I have to disagree on the gel pens. My experience is they work best and do not bleed. The biggest problem with photo guest books: They create traffic jams and can delay a wedding if set out prior to the ceremony. Anyone else want to share their experience with pens........please. 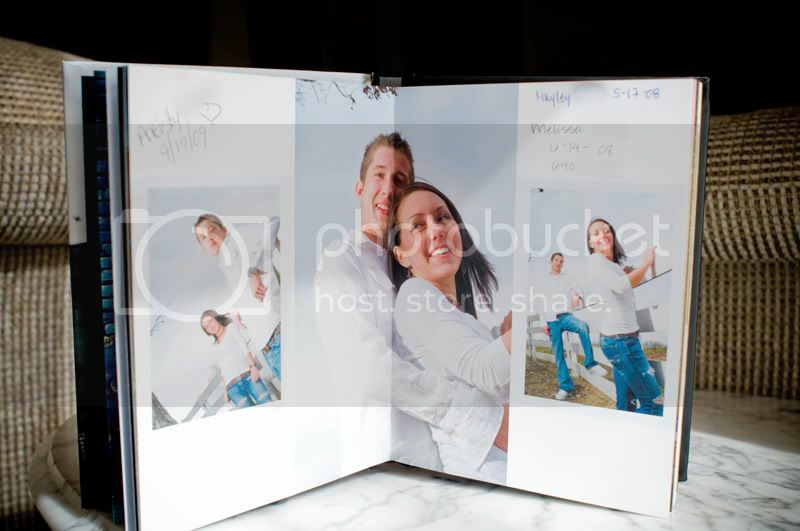 I am so excited, my next bride just picked her images for the guest book, I will post it when I am finished. Thanks for the information and inspiration. Karen, I'm going to design a guest book for a bridal fare I'm helping coordinate. I'm eager to hear the reactions from the brides! Love this idea... I've seen it done before, but not with the artbook. Vision helps make it a beautiful option. These books are straight-up glorious, and I am going to order a large one as a wedding sample straightaway. So happy! These are beautiful and I LOVE your design and style but I gotta say... I am cracking up over the evil-looking hand in your third post, grasping out of the dark. Tara .. so you find that these sizes are good enough?? 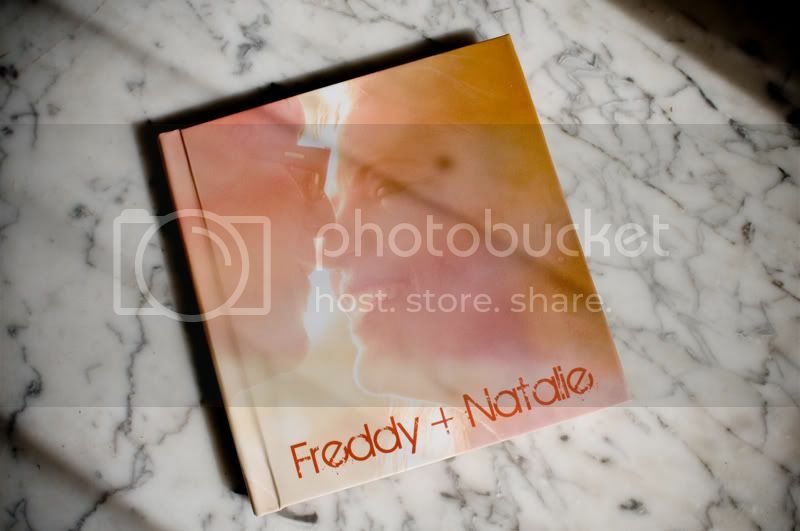 I'm just starting with the e-session books guest signing books ..
do you charge as much as you would for a wedding album? 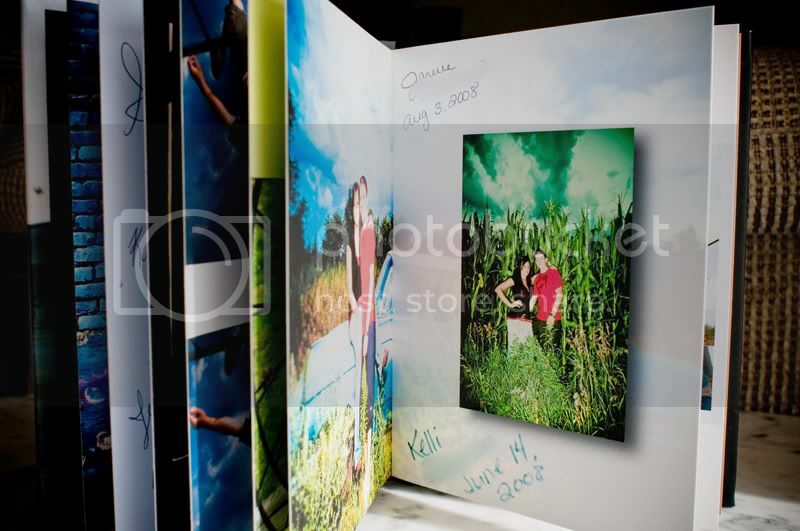 I don't offer these sizes for wedding albums, only for parent albums. 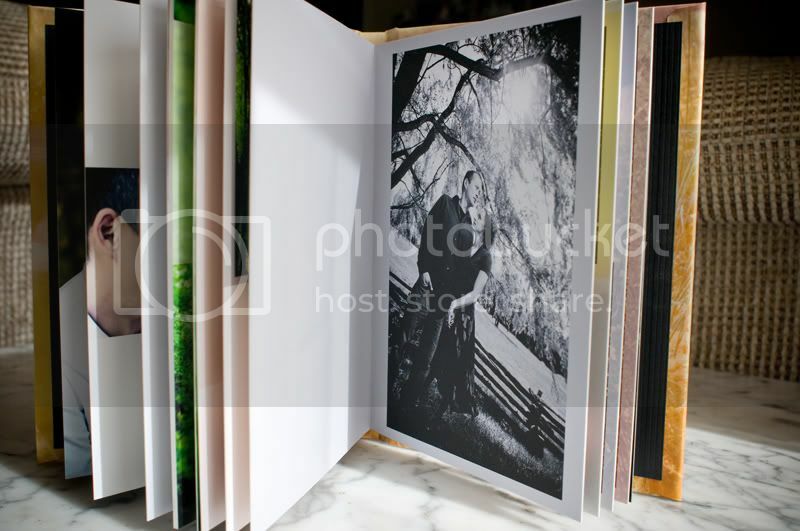 I do charge less for the guestbooks than the parent albums, because typically, the parent albums contain twice as many spreads and photos, and take a whole lot longer to design. can I ask how much you would charge for one of these guest signing books? I charge cost x4, plus a little more for shipping I quote free shipping, but it's factored into the cost. Do you ever use "lines" for the guests to sign on? Do most of the guests figure out how/where to sign? Do they crowd the first few pages and the latter pages tend to be blank? Norris mentioned they could slow down the start of wedding. 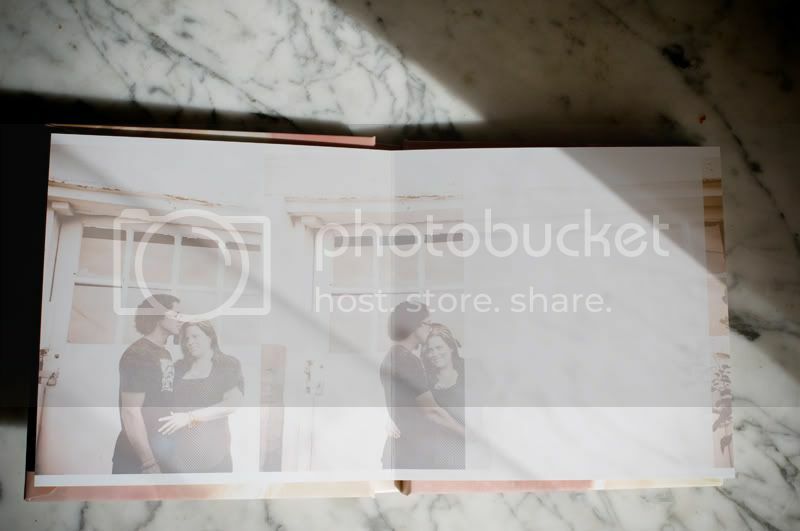 Do you find this to happen because every guest wants to flip through the book to see all the pictures? Have you tried setting it out at the reception to see if it works better? this is such an amazing idea, i never would have thought of it! i just read this thread 2 days ago and suggested it to a bride and have already sold one! wowza. i am so psyched about this! i am ordering two copies - one for the clients and one for my sample. yay. Can someone who works for Vision Art chime in on the best archival pens to use with the VA book as a guest sign-in book? Thanks! Penny, any pen will work. This paper is design to absorb ink. We just had a party last night where I made a sign in book for myself and I watched different pens being used, from gel to ball point to felt. They all worked perfectely. There is only one pen that caused me problems in the past - A porous tip cross pen refill. No problem to the paper, but it clogged up the breathing hole on the pen and it stopped working almost immediately. So have at it. Whatever you have should work just fine. I don't use lines, simply because I don't like the way they look. I don't want to make a book that looks like a traditional guestbook. I usually suggest that they bring the book to rehearsal and pass it around for family members and wedding party to sign, and ask them to sign on random pages. Guests usually get the hint. If they have a small wedding, then it's fine to present before the ceremony. If it's a large wedding, I suggest presenting it at the reception instead. But, I usually just leave it up to the bride and groom on how they want to do things Most of the time, they assign a guest book attendant to worry about all of that so they (and I) don't have to.